White, yellow, red and even purple, potatoes come in colors that might surprise you. Shapes and sizes differ as well, from huge 1-pound baking potatoes to new potatoes the size of marbles. Potatoes by themselves are good for you. It's when the potatoes are loaded down with salt, butter and sour cream that they enter the forbidden zone. 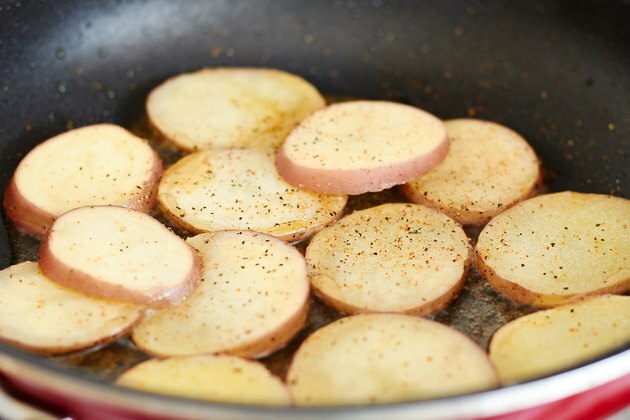 Serve pan-fried potatoes as the main dish, side or in a salad, but first you have to cook them. Scrub the potatoes, then cut them into chunks, slices, cubes or shreds. Make all of the pieces the same size so they cook at the same time. 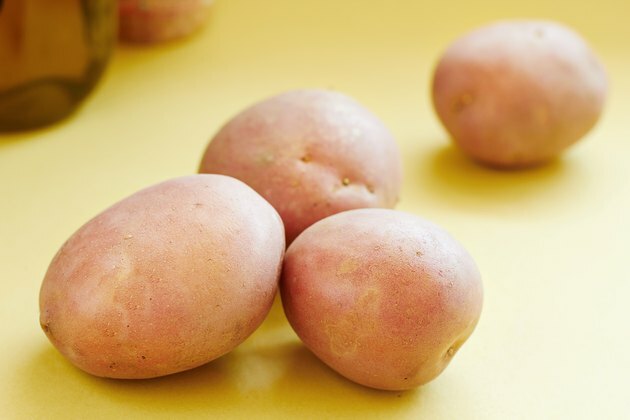 Put cut potatoes in cold water. Drain and pat dry just before you're ready to cook. 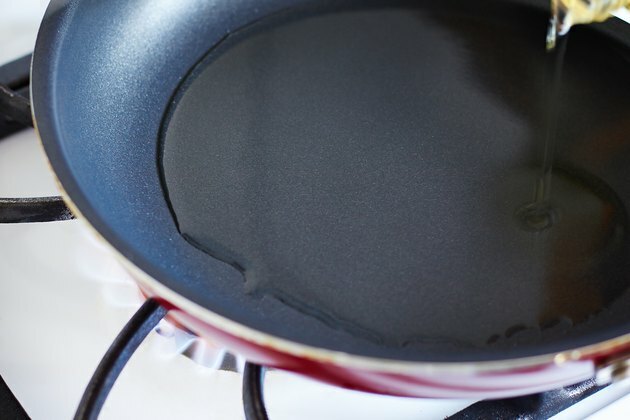 Cover the bottom of the pan with canola, olive, peanut or corn oil. The less oil you use, the less the potatoes will absorb and the lower the calorie count. 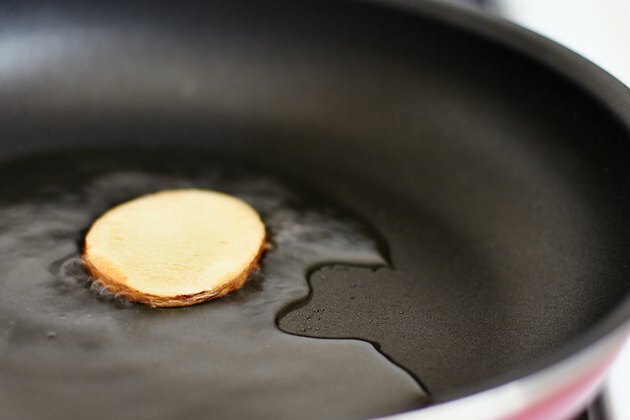 Place the pan over medium-high heat. Place a piece of potato in the oil. If it doesn't immediately sizzle, wait a minute and try again. Add the rest of the potatoes to the pan in one even layer. Don't crowd the pan or the potatoes won't brown properly. Sprinkle on your favorite seasonings, such as garlic or onion powder, rosemary, tarragon and sage. Bring up the spice level by adding cayenne pepper, curry powder or chili flakes. Or stick to salt and pepper for classic potatoes. Stir the seasonings into the potatoes with a spatula or pair of tongs. Saute until the potatoes are brown and crisp on the outside and soft in the inside, from 10 to 20 minutes. Smaller pieces of potatoes cook faster than large ones, so the exact cooking time will vary depending on how you cut the potatoes. Garnish the potatoes with fresh herbs, such as dill, parsley or thyme. Add a sauce made from non-fat yogurt or non-fat mayonnaise mixed with a bit of the seasonings you used. Complement the potatoes by adding raw vegetables, such as green peppers, poblanos, onions, scallions or zucchini during the last five minutes of cooking. Cook potatoes until a fork easily pierces the potato. 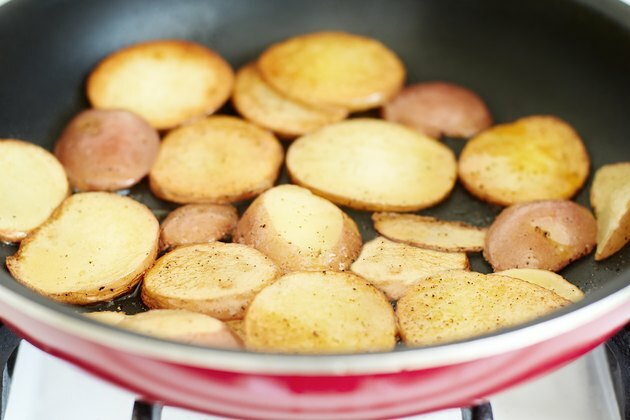 Overcooking pan-fried potatoes results in an unpleasant chewy texture. Leave the skins on the potatoes unless the skins have a greenish tinge. The green is from solanine, which is toxic and can make you sick.